Fernando Vianello, Natural (or Normal) Prices: Some Pointers. Mauro Caminati, Cyclical Growth and Long-Term Prospects. Graham White, Normal Prices and the Theory of Output: Some Significant Implications of Recent Debate. Chidem Kurdas, Essays on Piero Sraffa: A Review Article. 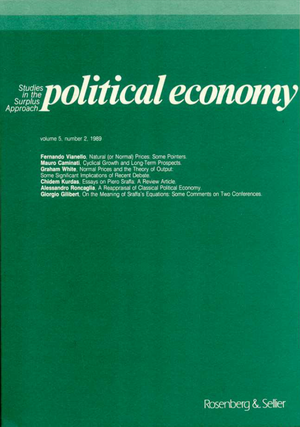 Alessandro Roncaglia, A Reappraisal of Classical Political Economy. Giorgio Gilibert, On the Meaning of Sraffa’s Equations: Some Comments on Two Conferences.